It is not required to have a wedding receiving line at your wedding. But certainly, greeting your guests and thanking them for coming is proper etiquette. Here are some helpful hints to help you decide what is best for your wedding. How do i greet my guests? For weddings with a large amount of guests, a receiving line can be the best way to be sure that you don’t miss anyone. It can also help you be sure that all the guests have a chance to meet the your parents and attendants. With the recent trend toward smaller weddings, it’s fine for the bride and groom to visit with each table—usually during the meal—to greet, thank and chat with their guests. 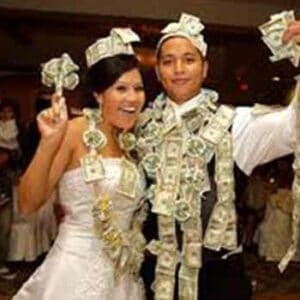 Where Should We Set Up The Receiving LIne? Setting up the wedding receiving line at the exit of the ceremony allows you to greet everyone as they move toward the reception. 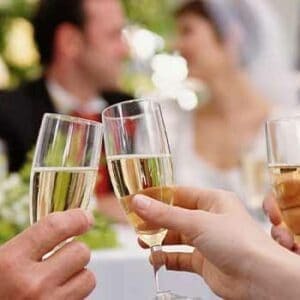 If your wedding has many guests, it would be helpful to have access to drink or food. Here in Oregon, with many weddings being outdoors, making your guests wait in the heat doesn’t help your guests stay n the party mood long. Who Stands in the Line? Traditionally, those who are in the receiving line are the hosts for the wedding. Beginning with the bride’s parents and then the groom’s. The couple is usually next in the line with some or all of the wedding party. This is not a good time for lengthy conversation, but quick introduction and thanks. There will be time for that later during the reception. These tips will help you make the decision whether to do a wedding receiving line. Helping your plan your wedding timeline is one of the many services we provide as your DJ/Emcee. Contact us today and let’s start planning your wedding!